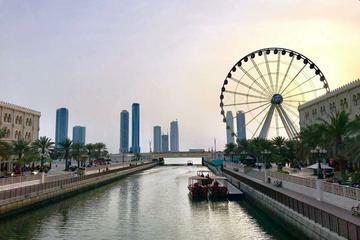 Get to know the spirit of Sharjah City during this 4-hour tour from Dubai. With your guide and group, explore the highlights and landmarks of the city known as Pearl of the Gulf. Stop at landmarks such as the Al Arsa souk, the Heritage Museum and the King Faisal Mosque. Learn about the culture, traditions and history of the city from your guide. Entrance fees and round-trip transportation from Dubai hotels are included. Begin your day's excursion to Sharjah with convenient pickup at your Dubai hotel. Get to know your guide and group during the journey to the nearby city, known as the Pearl of the Gulf. Upon arrival, follow your guide to some of the highlights and landmarks of the city over the course of 4 hours. Stop at the King Faisal Mosque, one of the largest mosques in the country. Continue to the Fort of Sharjah, which dates from 1820 and was the former home of the ruling family. Visit the city's Heritage Museum to get a better idea of its rich history, then peruse the Al Arsa souk for souvenirs and mementos of your trip. You'll also stop at the Al Markazi souk, famous for its traditional handicrafts, jewelry and carpets.